The real estate market in Vegas is like no other in the country. With five thousand people moving to the Las Vegas Valley every month, the growth is unprecidented and the competition for the best cribs is unparalelled. If you're looking to buy or sell a home, town home, condo, or high rise in this competitive market, you need a realtor who understands your unique needs. 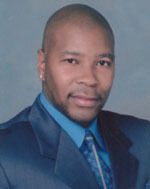 Jamerson Holloway of Century 21 Aadvantage Gold is that realtor. Jamerson understands that it is not just people in their forties, fifties, and sixties who are looking to buy a quality home, a luxury condo, a true crib in Las Vegas, a city famous for being one of the most exciting places in the country for the young and old alike. He's noticed that eighty percent of the realtors tend to cater to twenty percent of the market. Jamerson has a better understanding of who his clients and potential clients are. Jamerson's clients are the entertainers, executives, and performers of the Entertainment Capital of the World. They are the new blood that pumps through the veins of this thrilling city that truly never sleeps. They are people like you, overlooked and unapreciated by the traditional realtors who serve what they believe is the status quo. If you're tired of not being taken seriously or of getting the "runaround" from other realtors when looking to buy or sell a crib in Las Vegas, look no more and contact Jamerson today!